The Avery Memorial Association is a family organization of descendants of Christopher Avery and his only son James who came from England to Gloucester, MA before 1642. 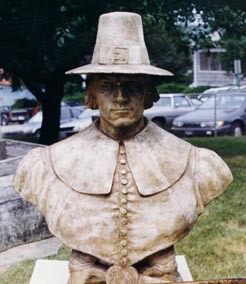 About 1650 James came to Pequot (New London), CT. The Avery Memorial, with its granite column and bronze bust of Captain James Avery (1621-1700), founder of the Groton Averys, stands on the site of the house in Groton long known as "The Hive of the Averys." Here, the second Captain James Avery, oldest son of the founder, lived with his family from 1671 until his death in 1728. This house ("The Hive") was continually occupied by members of the Avery family until July 20, 1894 when it was totally destroyed by fire started by sparks from an engine of the nearby railroad. 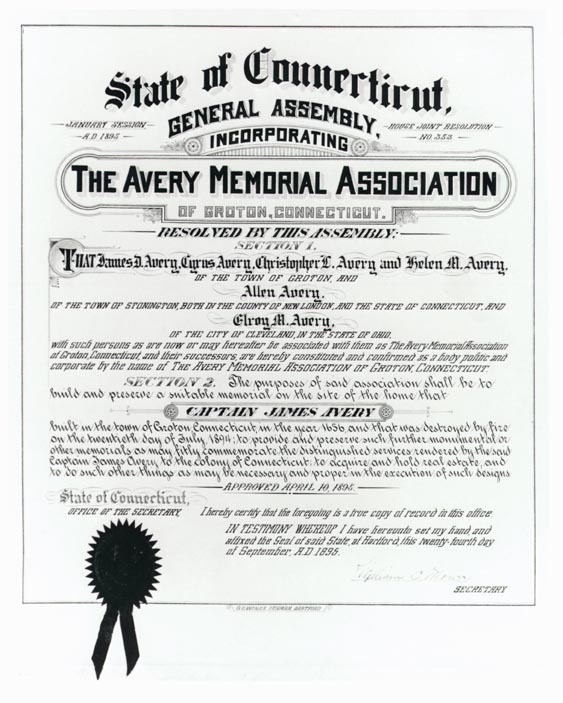 The Avery Memorial Association was organized in 1894 after the burning of the Hive, and was incorporated in 1895 under the laws of Connecticut as a non-profit, charitable and educational institution. It is fully responsible for the care of the Memorial at the site of the Hive, the Avery-Morgan Cemetery (the first Avery burying ground in Groton, CT), and the restoration and upkeep of the Ebenezer Avery house where the wounded were cared for after the battle at Fort Griswold, September 6, 1781. Membership in the Association is by application and, as of July 2007, has two categories: 1) Active Member - descendants, or their spouses, of James Avery and 2) Friends of the Avery Memorial Association. Note: We are endeavoring to stop spammers from using our e-mails. If you want to e-mail us, just substitute "@" for "-at-". The Avery Memorial Association is always encouraging donations to be used for the repairs & restoration of the Ebenezer Avery House and the Avery Monument. Doners will receive a receipt. We are a 501(C)3 non-profit organization. To donate right now via PayPal, just click on the DONATE button below. Just click here and log onto FaceBook, then search for "Avery Memorial Association." To view Volume One, click here. To view Volume Two, click here. Click here for a copy of our current ByLaws. Click here for info on purchasing products of interest to Avery Families. You are visitor # 112101. Welcome!